Passed away peacefully surrounded by her loving family on Thursday, November 15th, 2018 at the Western Memorial Regional Hospital, Palliative Care unit, in Corner Brook, NL, Agnes Marie Janes (nee) Stevenson, in her 92nd year. Leaving to mourn with fond and loving memories her 3 daughters; Regina (George) Chynn, Caroline Allen, and Lorraine Janes all of Deer Lake, NL, her three precious granddaughters and one precious grandson; Lori Chynn of Deer Lake, Tammy (Gavin) Cunningham of Worthing, England, Jillian (Trevor) Lush of Hammond, Ontario, and Jim Janes of Ottawa, Ontario, her three most precious great-granddaughters; Regan Cunningham of Worthing, England, Isabelle and Juliette Lush of Hammond Ontario, and a very large circle of friends. Agnes was predeceased by her husband; Jim Janes, her parents; John and Frances Stevenson, her parents-in-law; James and Caroline Janes, her great-grandson; Logan Cunningham, and grandson-in-law; John Pelley, and a large number of brothers and sisters-in-law. 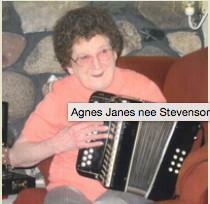 Agnes lived a long life and loved to dance, play her accordion, and key board, her greatest and most precious moments and memories were spent with her grandchildren, and great-grandchildren, she loved her bingo and scratch cards. The family will be receiving family and friends at Parsons Funeral Home & Chapel 63 North Main street, Deer Lake, NL, on Sunday, November 18th, 2018 from the hours of 2-4 & 7-9 pm. The funeral mass of Christian burial will take place on Monday, November 19th, 2018 at 10:30 am at The Immaculate conception Parish, Roman Catholic Church on Nicholasville Road, Deer Lake, NL, with Father Gabriel officiating with the burial to follow at the family plot of the Roman Catholic Cemetery, on High Street, Deer Lake, NL. Flowers will be gratefully accepted and or donations to one’s choice. To sign the guest book or send a message of condolence please visit our web page at www.parsonsfuneralhome.com. The funeral arrangements have been entrusted to Parsons Funeral Home & Chapel 63 North Main Street, Deer Lake, NL. Special thanks to all the staff in the emergency dept, the third floor and especially the nurses at the palliative care unit of the Western Memorial Regional Hospital, in Corner Brook, NL, Fr: Terry, Fr: Jason and Fr: Gabriel, for their visits and David and Brenda Parsons for their loving care.